Since tuition does not cover the actual cost of educating a child at CKRS, the TIP program was developed to help raise monies for the school along with aiding parents with tuition reduction assistance. TIP is an important aspect of the school’s fundraising goal. The fundraising goal this year is set at $125,000. TIP, along with Annual Fund, make up an important part of CKRS’s school budget. By participating in TIP, you, the parent, also receive tuition credit for the school year starting with the first dollar you spend on any of the below fundraisers. That means, by utilizing the program, you not only help the school achieve its goal, but you also help reduce the total amount of your tuition for next year! Through the support of local grocery stores, CKRS families are able to purchase gift certificates at face value with a 5% vendor rebate going to the school based on your purchase price (this figure is the TIP Allocation). The TIP Allocation is broken down as per the example above. The orders are filled every day and sent home with your child in a red envelop for easy identification. The Grocery Certificate order form can be found by clicking the "TIP Order Forms" located on this page. On the following page you will find the appropriate link for the order form. Please use this form when ordering your certificates. For ease of ordering we have several families that have graciously offered to sell the certificates from their home during the week, week-end and summer. Scrip is a program that sells gift certificates to families from national and local retailers. Families purchase the certificates at face value. 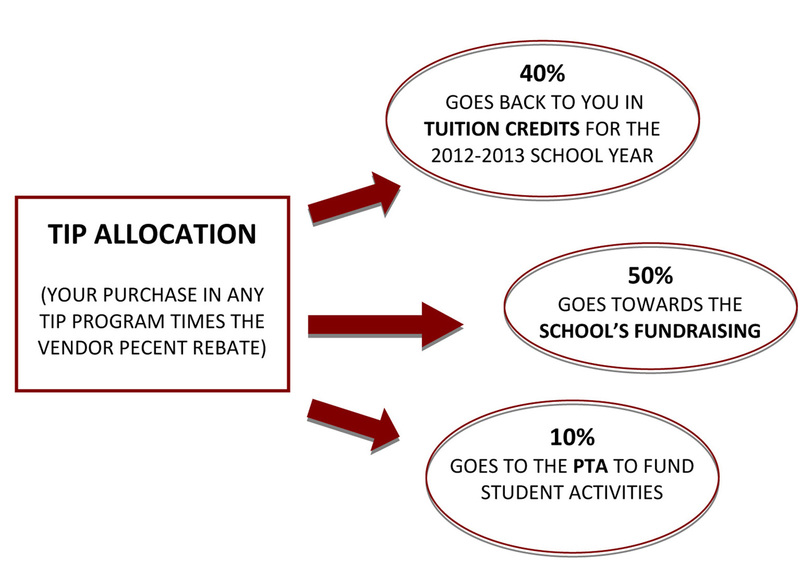 Depending on the merchant, a vendor rebate is given to the school based on your total purchase (this is the TIP Allocation). The TIP Allocation is divided as per the example above. Scrip orders are placed every other week except around Christmas time when the order is placed every week. On Scrip weeks, the order must be sent to school by Tuesday morning. You will receive the certificates in a red envelop on Friday. The Scrip order form and merchant list can be found on the bottom of the page by clicking on the “Scrip Forms” link. The Merchant List is updated on a weekly basis with vendors constantly being added and deleted. Zip Scrip is a similar program to Scrip, with gift certificates from national and local retailers. The difference being that there is a limited amount of vendor’s gift cards that are on hand in the school that can be ordered any school day of the week. Send your order into school Monday – Friday and receive your order home on the same day in the red envelope. Please click on the “Scrip Forms” link at the bottom of this page. You will find the Zip Scrip order form and the list of merchants on the preceding page.